When my dear SIL asked me last fall if I could sew her a sewing machine cover for Christmas, I was a little bit hesitant. The reason was not that I didn't want to make one for her but since we live over 1.000 miles away from each other, I wouldn't be able to make any adjustments during the sewing process. It just would have to fit. Eventually, I agreed and hoped for the best. My SIL sent me all the measurements and asked for beige and brown tones if possible. She didn't have any special design wishes and I considered a variety of options. Finally, I stuck with the first idea. I drew a sewing machine and turned it into an appliqué pattern. I machine appliquéd the pieces with a narrow satin stitch. The sewing machine cover has pockets on both sides for scissors, a tape measure and other sewing notions. On top I added a fabric handle for easy uncovering. For the pictures I had to stuff the sewing machine cover with textiles. This is obviously not the perfect fit but I was very happy to hear that the cover fits on my SIL's machine perfectly. Since my SIL's sewing machine lives in the basement, I thought a little mouse pincushion would be a suitable companion. You can find the pattern HERE. It's not mentioned but you should clip the curves after sewing the pieces together, but be careful not to cut into the stitching. My own sewing machine got a little jealous. She finds her plastic cover so boring now but I'm guilty of not covering her up most of the time anyway. Do you always cover up your machine after you are finished with a sewing project? That's nice!! A wonderful cover for your machine. And what a funny mouse. Great!! Das ist ja cool. So was brauche ich auch unbedingt mal und mit der Maschine drauf sieht das richtig klasse aus. I love both of these. Both are very clever and a perfect gift. I guess I never thought about covering up a sewing machine, but then I don't sew a stitch! Your work is so professional and beautiful! I did make a duck cloth canvas cover for my machine, but now I wish I had decorated the front-and those pockets you added are fantastic. So is the mouse! Das ist die allerschönste Nähmaschinenabdeckeung die is je gesehen habe und das Mäusenadelkissen ist fantastisch dazu, wenn Deine Schwägerin im Hobbykeller arbeitet! So eine süße kleine Maus...werd mir den Link abspeichern! knuffig! Danke! Wundervoll gemacht Julia, Deine Schwägerin kann sich glücklich schätzen --ein Meisterwerk ist das! Liebe Julia, du bist klasse und ich liebe deine Ideen! Meine Nähmaschine steckt im Koffer - und hätte ich keine, würde ich mir solch eine tolle Abdeckung von dir wünschen! Sogar die Stickstiche hast du hinzugefügt, und wie praktisch auch die kleinen Seitentaschen! Das war bestimmt eine große Überraschung! Ganz niedlich ist auch das Igel-Mäuschen, besonders der Schnurrbart! Oh, my gosh, Julia. You should market these covers. LOVE it - especially with those sweet side pockets! And the littlet mouse is icing on the cake. What a wonderful gift. I'm sure your friend is thrilled! A wonderful gift to your SIL, it looks both beautiful, and sweet, the pockets a wonderful idea,- and the mice is so cute . No, I have to say, I never cover my machine, Julia, it is always out and ready to work :-) I`m sorry I have not written for long, but we had some months of worry with Henning, - we just got message that all is well,-I will soon write you dear friend. Sending you hugs, and love, for a beautiful weekend !! Oh Julie this is so great. What a beautiful job you did on this. Love all the fun details. Girl you need to make things like this to sell. You would sell these out quickly. Just adorable. Love the little mouse too. How cute is that. What a beautiful gift for your SIL. That came out great! I like the mouse too. Adorable!! How could your SIL help but love it?!?! And the little mousie? TOO sweet!! What a delight, Julia! Your design and stitching are perfect. Satin stitch applique is not easily mastered. Yours is perfect. I smiled when I saw the decorative stitches window on the machine. And the buttons and stitching (it looks like) for the stitch dials. And adding the needle thread tension slot! Awesome! I started a cover for my machine, but it currently is one of those UFOs. I never used to cover my machine and never bothered putting it’s heavy, hard travel cover on. But in my old age, I’ve become tired of dusting it off. So I throw a cotton dishtowel over it when I’m not sewing. That cover is waiting for me to get back into the mood to continue working on it. das Mäntelchen für die Nähmaschine ist traumhaft schön geworden, tolle Idee und wunderschön umgesetzt, gefällt mir sehr sehr gut. That's awesome Julia and it's so beautifully done too. You SIL must be so impressed. I must admit I'm a little jealous, we always cover our sewing machine up otherwise the purr babies go into attack mode and we end finding reels of cotton and bobbins in the strangest places. But our cover is just a boring old sheet and no where near as pretty as this one. Wonderful cover. I'm sure your SIL loves it. I don't sew. Only used a sewing machine once in my life and that was under the guidance of a co-worker who was trying to teach me how to use it so I could make a log cabin pillow cover. Let's just say, she had to finish it because I had a hard time controlling that dang pedal. :) Cute little mouse, too. 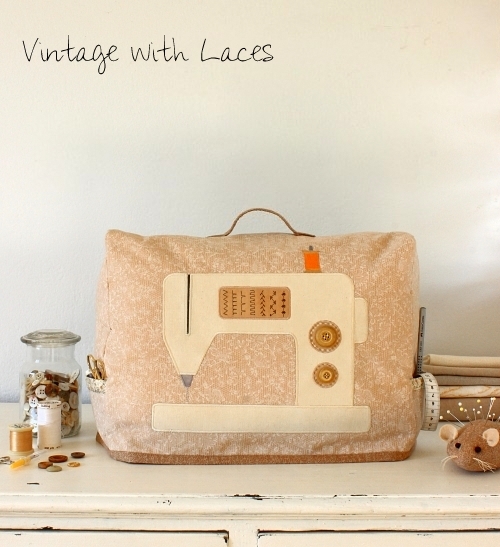 This is the prettiest and most beautiful sewing machine cover I have ever seen Julia! You could make them and they'd sell like heisse Semmeln ;) Anyways, all you touch turns into gold, so this is no exception. My sewing machine is jealous too! It sits in a closet... uncovered. So unique. The side pockets are a great idea. I love the details on the appliqué. That spool of thread looks so real. I kept staring at it trying to decide if somehow you just balanced one on it for the photo. Really cute. wow, das ist fantastisch geworden (und sieht nach richtig viel arbeit aus! ), so wunderbar detailverliebt - mit den praktischen taschen, ach... deine Schwägerin ist ein Glückspilz! das mäuse-Nadelkissen ist auch total putzig! so ein hübsches Kleid für eine Nähmaschine! Das schaut richtig dekorativ aus. Ich bin immer wieder fasziniert von deinen kreativen Ideen. 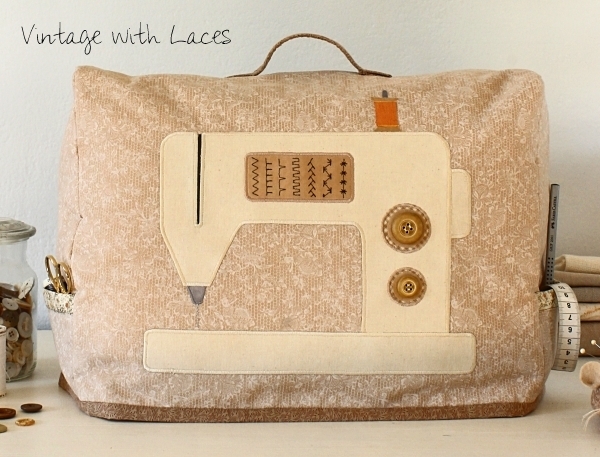 The sewing machine cover is wonderful and I know how happy your SIL would be with it. As for the little mouse pincushion, he is the sweetest. Most of the time my sewing machine does not get covered and mine has a plastic cover also. Your SIL must have been over the moon, dear Julia. 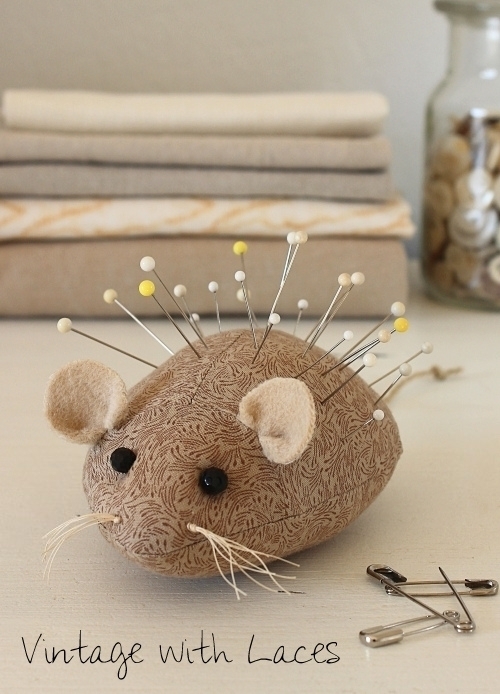 The mouse pincushion is so cute and adorable. Have a happy Valentine's day tomorrow. That's a super cool cover and one ouchie mousie! Thanks for the kind words on the passing of our sweet Sister Kit, we appreciate them. habe mir vor längeren Zeit auch mal eine genäht.